A new generation of hulls offering greater sensations in terms of speed and acceleration, while improving boat safety, comfort and efficiency. Developed in 2003, Air Step technology was the result of an ambitious research programme. 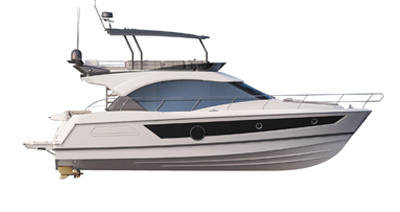 Its goal was to develop a new generation of hulls offering greater sensations in terms of speed and acceleration, while improving boat safety, comfort and efficiency. This patented technology now equips boats up to 50 feet. BENETEAU Air Step® patent - Designers: Patrick Tableau, Maud Tronquez, and Rémi Laval-Jeantet. Derived from aeronautical industry technology, the Air Step® forms small steps under the hull that help evacuate the water stream and reduce the amount of friction. Combined with captured air forming a cushion, as well as runners to the rear of the hull increasing stability, these chevronned steps considerably increase speed, while reducing energy consumption.The second generation of Air Step® is marked by a considerable increase in the volume of air inflow beneath the hull. It took more than 18 months of research and 350 hours of testing to obtain a new combination increasing airflow and changing the shape and arrangement of the steps. Air Step®2 technology is now compatible with IPS engines, thanks to the research carried out by BENETEAU in close collaboration with the staff at Volvo. This technological progress opens wonderful development perspectives for large new inboard motorboats offering stability, safety, and performance second to none. From 5.5 meters outboard to large 50-foot inboard motorboats, Air Step® technology offers overwhelming advantages when cruising.